How did your bracket do this year? Yeah, let’s not talk about that. 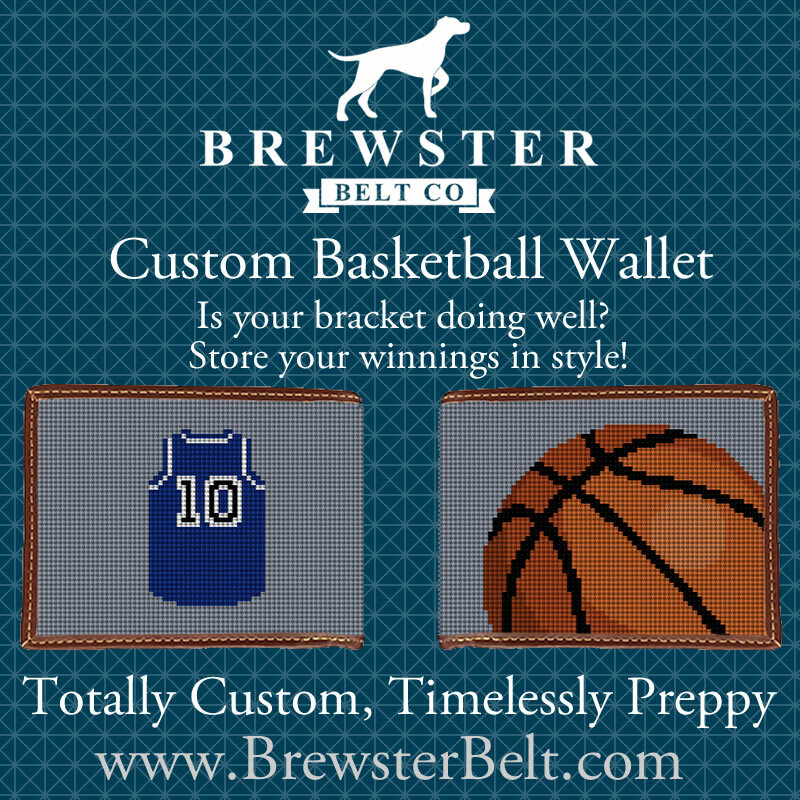 March Madness is coming to a close, but you can still root for your favorite college basketball team and show your support with custom needlepoint basketball belts and accessories from Brewster Belt Company. If your bracket does well this year, you can stash your winnings in a custom, needlepoint basketball wallet. All wallets can be customized with your own design or choose from one of our many sports designs and choose your own colors or add a monogram. Whatever ideas you have for customizing our designs or creating your own, Brewster Belt Company’s designers are happy to work with you to create a fantastic and original needlepoint belt, needlepoint wallet, needlepoint flask or needlepoint dog collar. For those of you basketball fans who want to root for your favorite college basketball team all year round, might we suggest one of our college campus needlepoint belts? It doesn’t get much more unique than these belts, which feature key landmarks including places like the college’s basketball and football stadiums. Here are some examples…. UNC is still in it to win it. Check out our University of North Carolina campus needlepoint belt. It’s a great statement for UNC fans. For basketball fans, Brewster’s UNC Needlepoint Belt features the Dean Smith Center basketball stadium. Although we haven’t designed a University of South Carolina, Gonzaga or University of Oregon needlepoint college campus belt yet, all of our needlepoint belts and accessories are custom, so we would be happy to design one for you or work with you to create a new design that you can call your own. There was certainly a lot of excitement for University of Florida basketball fans this year. Show your #gogators pride all year long with Florida campus needlepoint belt. Villanova fan? We’ve got you covered. And if you’re turning your attention to professional basketball, check out our NBA Arenas Needlepoint Belt. Passionate basketball fans who have a “bucket list” goal to visit every basketball arena across the U.S., can sport this detailed belt on their journey. Illustrated from left to right, the arenas include: Miami, Boston, Milwaukee, New York (Madison Square Garden), Chicago, Philadelphia, Cleveland, L.A. and Detroit. Illustrated from left to right, basketball arenas include: Miami, Boston, Milwaukee, New York, Chicago, Philadelphia, Cleveland, LA, and Detroit. Visit us at Brewster Belt to view all of our current needlepoint belt and accessory designs or create your own custom design.